Real Zaragoza, S.A.D. (Spanish pronunciation: [reˈal θaɾaˈɣoθa]), commonly referred to as Zaragoza, is a Spanish football team based in Zaragoza, in the autonomous community of Aragon. Founded on 18 March 1932 it currently plays in Segunda División, holding home games at La Romareda, which seats 34,596 spectators. A government survey in 2007 found that 2.7% of the Spanish population support Real Zaragoza, making them the seventh-most supported in the country. The club's main rivals are: SD Huesca, their opponents in the Aragonese derby; CD Numancia, from the nearby Province of Soria; and CA Osasuna, the largest club in the neighbouring Navarre region. Real Zaragoza was originally formed from two rival teams: Iberia SC and Real Zaragoza CD. In 1939, after three years without football due to the Spanish Civil War, the team made its first appearance in La Liga, ending in 7th position out of 12 teams, but being relegated in 1941. The club returned to the top division one year later, only to be immediately relegated back. It remained in Segunda División until the end of the 1950–51 campaign, when it achieved promotion by finishing second in a play-off league. On 8 September 1957, the team left its original stadium, El Torrero, for its current stadium, La Romareda. Beginning in the 1960–61 season, Zaragoza enjoyed a period of great success, showcasing some of the greatest players playing in Spain during that decade, which earned for themselves the designation of Los Magníficos. While the team failed to capture the league title, it finished in the top five every year until 1968–69, with two third-place finishes, and also won its first two Copa del Rey titles and the 1963–64 Inter-Cities Fairs Cup. 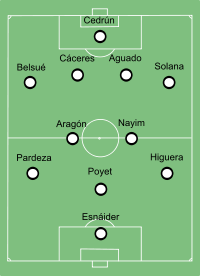 Zaragoza's famous attacking line included Canário, Carlos Lapetra, Marcelino, Eleuterio Santos and Juan Manuel Villa. The Peruvian Juan Seminario, who started his career in Spain with Los Maños before moving to Barcelona, won the Pichichi Trophy in the 1961–62 campaign, scoring 25 goals in 30 matches as Zaragoza finished in fourth position. In 1986, Zaragoza won its third Copa del Rey, defeating Barcelona 1–0. The club finished the 1990–91 season in 17th position, thus having to appear in the promotion/relegation play-offs against Real Murcia; on 19 June 1991, after a 0–0 away draw, a 5–2 home win meant the team managed to maintain its top level status. Víctor Fernández was appointed manager in 1991. On 10 May 1995, one year after winning the Copa del Rey against Celta de Vigo, Zaragoza conquered the UEFA Cup Winners' Cup against Arsenal at the Parc des Princes, Paris, after having disposed of the likes of Feyenoord and Chelsea en route. With the score level at 1–1, the two teams entered extra time and, in the 120th minute, Nayim hit a half-volley from just past the halfway line, putting it beyond the reach of goalkeeper David Seaman for the final 2–1. The club then contested the 1995 UEFA Super Cup against Ajax, losing 1–5 on aggregate despite a home draw in the first leg. Víctor Fernández was dismissed from his post in early November 1996, after only winning one league match that season. The 2000s brought a further two Copa del Rey titles to Zaragoza's trophy cabinet, including the 2003–04 edition against Real Madrid in Barcelona (3–2 after extra time). However, the club also suffered top flight relegation in 2002 after narrowly avoiding so the previous season, but achieved immediate promotion in 2003. In late May 2006, Agapito Iglesias purchased Alfonso Solans' shares and took control of the club, promising to build one of the strongest teams in Spain and Europe. In his first year in charge, he purchased Pablo Aimar from Valencia for €11 million, and former manager Víctor Fernández also returned to the club. Mainly due to Diego Milito's 23 goals in 2006–07 (he finished third to Roma's Francesco Totti and Real Madrid's Ruud van Nistelrooy – 26 and 25 goals, respectively – in the European Golden Shoe race), Real Zaragoza finished in sixth position, thus qualifying to the UEFA Cup. However, the following season ended in relegation – for the second time in the decade – with the side also being eliminated in the first round in European competition. Legendary club coach Víctor Fernández returned for a second spell, although he was sacked in January 2008, as the club had four managers during the campaign. On the last matchday, a brace from Ricardo Oliveira proved insufficient in a 2–3 away loss against Mallorca, with the team totalling 42 points to Osasuna's 43. Zaragoza achieved promotion from the second division at the first attempt. On the last matchday, on 20 June 2009, the team drew 2–2 at Rayo Vallecano with goals from youth graduate David Generelo and ex-Real Madrid defender Francisco Pavón, only trailing champions Xerez in the table. However, after four seasons mainly spent in the bottom half of the table, Zaragoza was relegated following the 2012–13 Liga season after finishing last. ^ "Vuelve el derbi aragonés" [The Aragonese derby returns] (in Spanish). El Periódico de Aragón. 29 June 2015. Retrieved 9 October 2018. ^ "El Zaragoza se lleva el derbi del Moncayo y piensa en el ascenso" [Zaragoza takes the Moncayo derby and thinks about going up]. Mundo Deportivo (in Spanish). 3 March 2018. Retrieved 9 October 2018. ^ "1-1. El derbi del Moncayo por la promoción se decidirá en Zaragoza" [1-1. The Moncayo derby for promotion will be decided in Zaragoza]. El Confidencial (in Spanish). 6 June 2018. Retrieved 9 October 2018. ^ "Odio, política e insultos a la virgen: tras la rivalidad más agria de la liga española" [Hate, politics and insults to the virgin: after the most sour rivalry of the Spanish league] (in Spanish). Playground. 12 October 2017. Retrieved 9 October 2018. ^ "Osasuna - Zaragoza: rivalidad de primera" [Osasuna - Zaragoza: premier rivalry]. Vavel (in Spanish). 20 February 2016. Retrieved 9 October 2018. ^ "Muere Santos, uno de los "cinco magníficos" del Zaragoza" [Santos, one of Zaragoza's "magnificent five", dies] (in Spanish). El País. 28 January 2008. Retrieved 29 July 2013. ^ "1994/95: Nayim's bolt from the blue sinks Arsenal". UEFA.com. 1 June 1995. Archived from the original on 22 August 2010. Retrieved 14 December 2011. ^ "Beckham misses out on Cup". BBC Sport. 17 March 2004. Retrieved 29 July 2013. ^ "Campeonato Regional Guipuzcoano-Navarro-Aragonés 1939-40" [Gipuzkoa-Navarre-Aragón Regional Championship 1939-40]. FutbolME (in Spanish). Retrieved 29 March 2019.